WASHINGTON, DC - NOVEMBER 17: John Wall #2 of the Washington Wizards waits for an inbounds pass in the second half against the Miami Heat at Capital One Arena on November 17, 2017 in Washington, DC. The fears were realized. Now reality kicks in for the Washington Wizards. They won’t just be without five-time All-Star guard John Wall for a game or two. Their leading man will undergo yet another surgical procedure on his left knee and miss 6-8 weeks. Sources confirmed the arthroscopic procedure and projected recovery timeframe for Wall to NBCWashington.com Tuesday morning. The team later announced the 27-year-old would have an “arthroscopic debridement procedure” on Wednesday at the Cleveland Clinic with a timeline to be determined. That’s where Wall had a procedure on both knees in 2016. Washington’s second-leading scorer also had injections in his knee right after Thanksgiving, which caused him to sit out nine games. Overall, Wall has missed 12 games this season including Saturday’s blowout win at Atlanta. Based on the two-month projection, that means sitting out 26 of the final 33 games, not to mention the upcoming All-Star game. Washington (27-22) certainly has not given up on the idea of contending for a spot in the conference finals and then some. Yet despite the knee procedure, lengthy recovery time and playoff fragility, the Wizards remain steadfast with their low-key plan entering the Feb. 8 NBA trading deadline, according to league sources. The primary focus remains adding a wing guard or perimeter threat, sources confirm, even after losing their starting point guard for an extended stretch. However, Washington has no designs on trading third-year forward Kelly Oubre or its 2018 first-round pick. That stance existed before Wall’s latest injury. That stance remains nine days before the trade deadline. There are, however, big picture factors the franchise cannot ignore. Wall’s four-year, $170 million contract extension kicks in next season. Returning in late March doesn’t mean back at full strength for a player averaging 19.4 points and 9.3 assists. The playoffs, if they qualify, begin in mid-April. The Wizards are currently tied with the surging Milwaukee Bucks for fifth place in the East standings. They sit 4.5 games ahead of the ninth place Detroit Pistons, who acquired Blake Griffin Monday in a blockbuster trade with the Los Angeles Clippers. Starting with Tuesday’s home matchup with Oklahoma City, 20 of their next 25 games are against teams currently in playoff position. 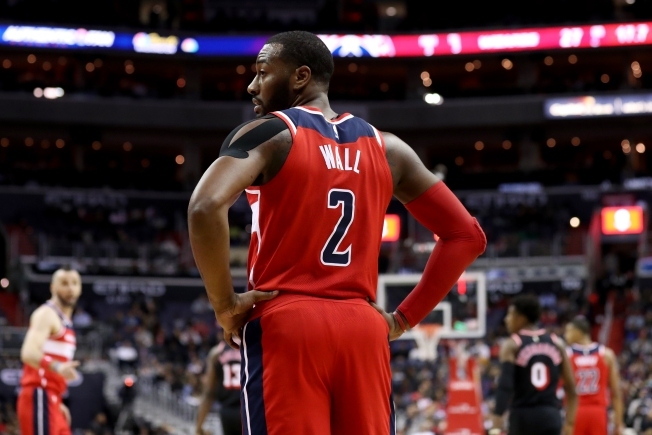 With all that going on, we’ll see if the Wizards remain part of that desired club whenever Wall returns. “It's obviously very bad news for us,” Tomas Satoransky said of the Wall injury news after Tuesday’s shootaround. That downer reaction is expected following such jolting news. There is just not time for sadness. There are games to play, decisions to be made. The Thunder arrive in Washington with a league-high eight-game winning streak. That includes Thursday’s 121-112 victory over the Wizards in what was Wall’s last appearance. The Wizards bounced back Saturday with a 129-104 rout over the Atlanta Hawks, improving to 6-6 without Wall. Point guard replacements Satoransky and Tim Frazier combined for 21 assists and only three turnovers. The Wizards had 40 assists on 49 field goals. Nobody should expect that type of production nightly. The Wizards will need that kind of ball movement to offset Wall’s absence and help prevent opponents from loading up defensively against their other All-Star guard, leading scorer Bradley Beal. Injuries have plagued Washington all season. However, the numerous setbacks to teams with losing records may ultimately undo the Wizards if they cannot hold on without Wall. Only the dismal Hawks have more losses against teams under .500 than Washington’s 11. For now, that is spilt milk. Making the playoffs is obviously important, but that is not the goal. True contention is. So is sustained success. The flashy Oubre, their 2015 first round selection, has turned into a strong and steady piece in his third season. Washington dealt its first and second round pick in three of the previous four seasons. They already shipped away their second-round picks in 2019 and 2021. The Wizards have Wall, Beal and Otto Porter locked up long-term, but at some point, they must keep their own selections for the purposes of adding young – and cheap – talent. Their salary cap situation demands it. If that means holding firm at the trade deadline even as they move on without John Wall for several weeks, so be it.